“Here are pics of me building the Archaeopteryx skeleton now owned by the Carnegie Museum of Natural History, plus shots showing me referring to the cast and the stack of references used to produce the original masters”. 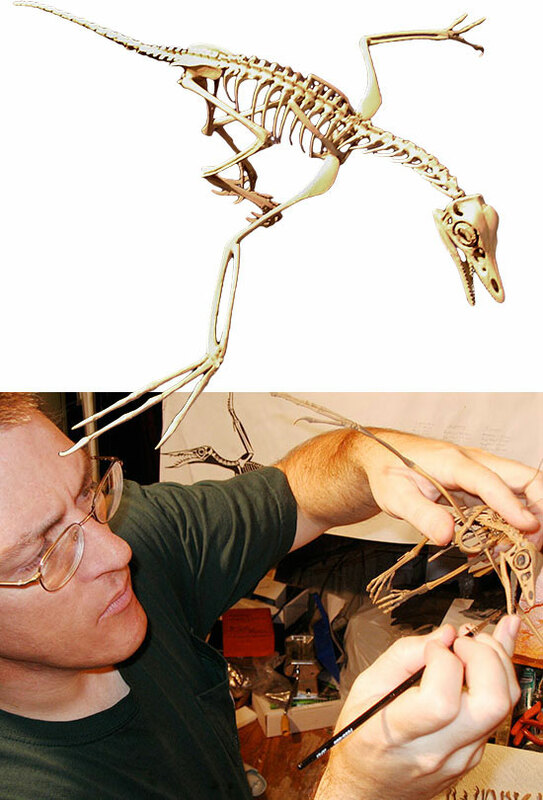 Bruce Mohn has been working as a professional artist since 1993, specializing in sculpted three dimensional reconstructions of the skeletons of small dinosaurs, early birds and pterosaurs. 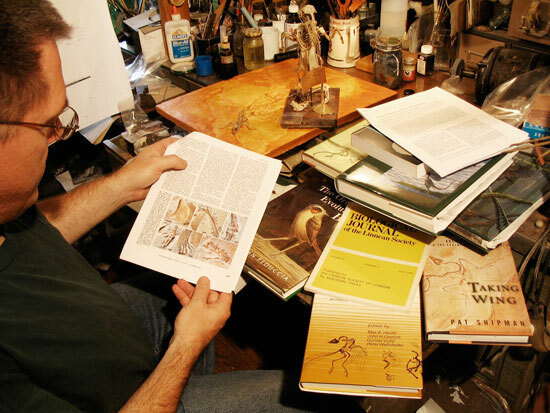 He is largely self-taught and derives his anatomical knowledge from training in anatomy, comparative anatomy and paleontology, including an internship at the Smithsonian's National Museum of Natural History's Vertebrate Paleontology Preparation Laboratory. He is a member of the Society of Vertebrate Paleontology and has presented lectures on theropod anatomy in a number of venues. How did you get started in palaeoart? I’ve never had any formal training. I either learned from trying various media on my own, by reading about it, by looking at sculptures or by watching other sculptors work. I sculpted a few dinosaurs when I was younger, but mostly sculpted whales and a variety of other extant animals. I began working in plasticine modeling clay, tried papier-mâché and then was introduced to Sculpey in the early 1970s. In college I designed an independent study project in dinosaur reconstruction and produced a number of life sculptures of Deinonychus, Compsognathus and Archaeopteryx. I was excited by the idea of being able to sculpt a full size (albeit small) dinosaur. My college advisor, Roger Wood, arranged for me to show my work at a fossil show at the Academy of Natural Sciences in Philadelphia. There I met Paul Sorton, a brilliant sculptor who was adding scales to his sculptures, applying them one at a time with a hollowed out toothpick! I quickly developed flexible latex mold stamps pulled from the skins of extant reptiles that have scale patterns that are close to those of dinosaurs and used those to add scales to my sculptures. I also met Bob Walters at that time. He became my agent. My first professional works were life reconstructions of dinosaurs for the Academy of Natural Sciences done in 1993. In 1995 I exhibited sculptures at the Society of Vertebrate Paleontology conference at the Carnegie Museum of Natural History. While there, I saw a mount of the skeleton of Coelophysis and (mistakenly as it turns out) thought that the bones had been sculpted. I was talking to Bob about it afterward and he dared me to sculpt a complete dinosaur skeleton. I chose Compsognathus because it was small enough to do in my home studio and I had an excellent cast of the skeleton, as well as a number of references. Why do you now focus on skeletons? I've always been fascinated by bones. I find them beautiful simply as objects and find that sculpting them accurately so that they actually articulate as they should is very satisfying. Think of them as three dimensional puzzles. People will argue over the postures I've chosen or the integument, but they never argue about the bones. Can you share some sculpting tips and techniques? My usual technique when sculpting skeletons is to start by gathering references. I've been fortunate to have contacts with professionals at a number of museums who either sent me references or allowed me access to the specimens in their care. I then produce a skeletal drawing at full size. I do refer to skeletal drawings by Greg Paul and others, but I always compare their measurements against those I take from either the actual specimens, high quality casts or photos with scale references and then make adjustments. Skulls and larger bones are made by making a two dimensional blank of Super Sculpey. Super Sculpey will take an impression from inked tracing paper. So to produce an accurate blank, I trace the bone, then flatten out a piece of Super Sculpey on glass, apply the inked side of the tracing paper and rub the reverse side until the image transfers. I then cut around the bone with a sharp knife and pop the cut-out piece on the piece of glass into the oven. Once it is cured, I cut away as much as possible, usually with a sand paper drum in a Dremel mototool. Then I add more Super Sculpey, bake it again and keep repeating the baking, grinding, adding stage until I have a complete three dimensional part. Smaller pieces like ribs, toe bones and verts are sculpted roughly, then baked, ground, sculpted, etc. When sculpting bones that articulate, like verts, I will completely sculpt one and then use it to shape the sides of the connecting verts. I test their articulations to make sure that their range of motion is correct and add or grind away material until it works properly. Bones that are preserved in two dimensions require a bit of guess work to determine their width. Sometimes there are related species that are preserved in the proper orientation that can be used to fill in gaps. I use Dremel carbide grinding bits, drill bits, pliers, cutters and sometimes hammers for sculpting hard materials. For raw Super Sculpey, I use rubber tipped sculpture tools, paint brushes, dental tools and my fingers. 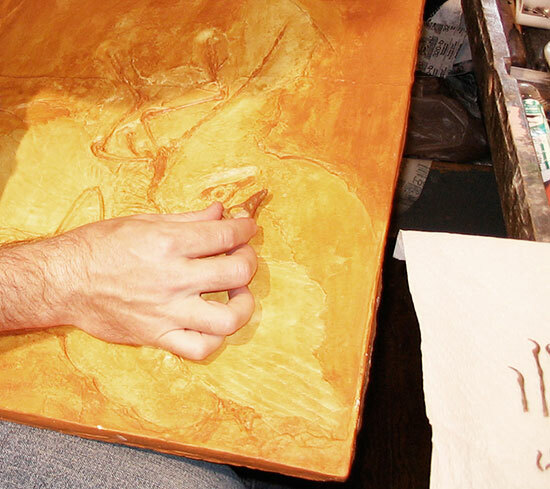 I use various grits of sandpaper to apply texture to the final masters and to cast bones. I work mostly in Super Sculpey, a plastic medium that cures in a regular oven at 275 degrees F. It is relatively friendly to work with, can be baked multiple times and can be machined. There are some issues with shrinkage and cracking, but generally it works well. I also work in copper and steel, especially when making really thin and delicate masters. Working in metal requires hammering, grinding and engraving, sometimes torch work as well. The final pieces are sturdy and survive the molding process. More recently I have used scrap resin to sculpt some of the tiny bones. It is flexible and doesn't crack, like Sculpey does. I've even used super glue as a sculpting medium! How did you choose the skeleton subjects? The first was Compsognathus. As mentioned, it was done after seeing what I thought was a Coelophysis skeleton composed of sculpted bones (it was actually a composite skeleton made up of three dimensionally preserved bones). I had already made skulls at that time, but hadn't considered doing an entire skeleton. Part of my process in making life reconstructions was to sculpt a reasonably complete skull over which I applied muscles and a skin coat. I had also rough-sculpted the pelvis, scapulae and limb bones, so sculpting an entire skeleton wasn't a big leap. Archaeopteryx was second and made as a companion piece to Compsognathus. I had long wanted to do a pterosaur skeleton and had drawn up plans for Dimorphodon when I was commissioned by the Carnegie Museum of Natural History to produce two Solnhofen pterosaurs for their revised exhibit halls. We agreed on Rhamphorhynchus and discussed various pterodactyloid pterosaurs before settling on Pterodactylus. Currently I’m working on full sized pieces of the skeletons of the dromaeosaurs, Velociraptor and Deinonychus. I would like to produce a full sized skeleton of Velociraptor some day and have drawn up plans for one scaled after the type specimen 6515 held by the American Museum of Natural History. It would be about five feet long. So far I’ve sculpted most of the bones of both feet and done several prototype skulls. 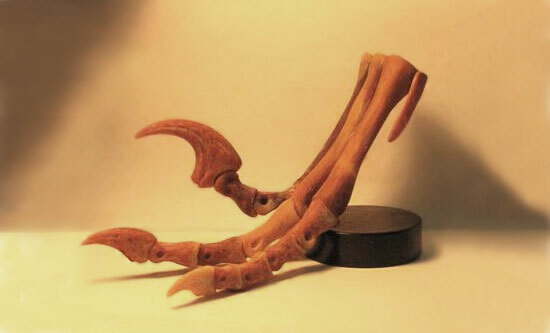 I recently began working on producing the bones of the left foot of Deinonychus. I have also considered doing Confuciusornis, Hesperornis and Sinornithosaurus. 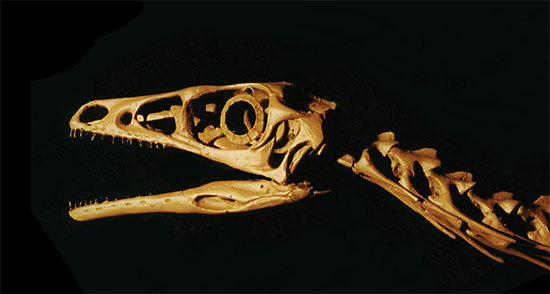 Sinornithosaurus is particularly interesting to me as it is a reasonable size and I have several hundred reference photos of the type skeleton, which I took during an exclusive photo session at the headquarters of the National Geographic Society. And I’m interested in producing Dimorphodon and possibly Pteranodon. My models are never finished, are yours? All my skeleton models are updated as new information comes to light. So yes, they continue to "evolve" wherever possible. Take my Archaeopteryx skull for example; when the mount for the Delaware Museum of Natural History was done the view was that Archaeopteryx lacked the postorbital bones of modern birds. Since then the view has changed and so they were added to the skull done for the Carnegie Museum of Natural History. I've never seen the hyoid bones on a mount before—on any dinosaur come to think of it. It's my signature, along with the sclerotics and the gastralia. The only bones I haven't done are the tracheal rings, but I've never seen those preserved in any fossil. 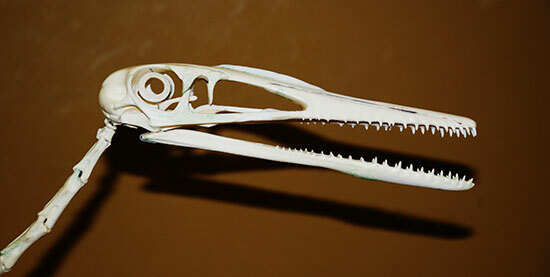 The hyoids are present in a number of pterosaur fossils and a few dinosaurs. I joke about “The Skelmaker's Curse”: once you sculpt a full skeleton you don't have the gumption to make another! How do you do it? It is hard, but if you have the energy and the drive it can be done. Look at Taburin-san. I can't believe how many pieces he's cranked out and how accurate they are. I've used some variations on his tricks on the pterosaurs.